Kelly was accused of illegally entering an Englewood home after attending a Halloween party hosted by Denver Broncos linebacker Von Miller. 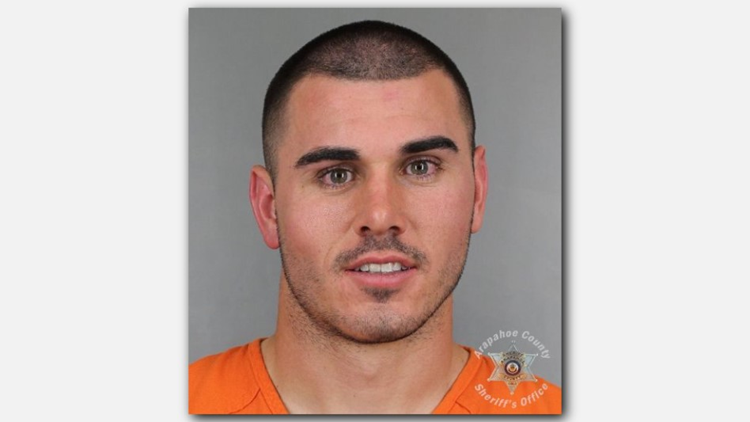 ARAPAHOE COUNTY, Colo. — Former Denver Broncos backup quarterback Chad Kelly appeared in court Wednesday morning where he pleaded guilty to a misdemeanor charge of second-degree criminal trespassing. Kelly made the plea during a hearing in Arapahoe County. As part of the deal, Kelly 24, will serve no jail time and must serve one year of supervised probation and perform 50 hours of community service. The victims in the case did not object to the deal, according to 9NEWS reporter Jon Glasgow who was in court for the hearing. He had originally been charged with first-degree criminal trespassing. If convicted on that charge, he faced up to three years in prison and a fine of up to $100,000. The plea means that Kelly was in "probable violation" of the NFL's personal conduct policy, according to 9NEWS insider Mike Klis. If Kelly signs with another NFL team, he could be suspended for a game. It also means the legal process has ended for Kelly which frees him up to return to football, whereas a trial could have extended into the season. Klis also reported that Kelly was confident he would hook up with an NFL team, despite the expected discipline from the league. He was arrested after Englewood police officers responded to an address in the 3200 block of South Lincoln Street following a report of a man standing outside a residence in the early morning hours of Oct. 23, 2018. According to an arrest affidavit, the man later identified as Kelly entered the home, sat down on the couch next to a woman inside and began mumbling incoherently. The woman called for another resident in the home, who entered the living room and hit the man in the upper back with a stick, which police later determined to be an aluminum pipe from a vacuum cleaner, the affidavit says. Kelly was chased out of the home according to the affidavit and was located a short time later sitting inside a black SUV outside the Gothic Theatre. Broncos linebacker Von Miller hosted a Wild West-themed Halloween party at the Gothic Theatre the evening before Kelly was arrested. Security footage from the home Kelly is accused of illegally entering shows a white man wearing dark pants, a white long-sleeved shirt, brown vest and red scarf around his neck outside the home, the affidavit says. Kelly was cut by the Broncos in the days following his arrest. The Broncos drafted Kelly, the nephew of Bills quarterback Jim Kelly, with the last pick in round 7 of the NFL draft -- a selection that comes with the "Mr. Irrelevant" distinction. Kelly was arrested in December 2014, in Buffalo, according to USA Today. In that incident, he faced several misdemeanor charges for trying to fight nightclub bouncers and police officers after he and a friend refused to leave a bar, the paper reported. He eventually plead guilty to a misdemeanor charge of disorderly conduct. At the time, Kelly had signed to play football at Ole Miss. Earlier that year, Kelly was dismissed from the Clemson University football team for "detrimental conduct,"USA Today reported.